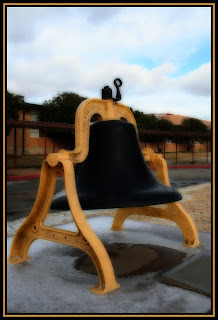 This is the old school bell that is outside of the elementary school here in town. The bell was moved from the site of the original school building in the 60's, but before that it was used not only for school purposes, but to announce news, call a town meeting, tell of a birth or a death, etc. I tried the Orton technique on this picture to "jazz it up" some. At first I didn't like it, but it's grown on me a little bit. Settings were AV mode, f11, ss 1/500, ISO 800, 18-55 mm lens. CC always appreciated! Thanks! It almost looks like the picture was colorized like they do old black and whites. Pretty cool. I think it looks GREAT with the orton!! Gives it a very nostalgic look! Nice job! Took me a minute to figure out what I was looking at but i really like it. It really does look all "old-time-y". Makes the colors really jump out too.